Dulce, New Mexico (Google pointer) is in Rio Arriba County about 10 miles from the Colorado border. The population was 2,623 in the 2000 census, almost entirely Native American, the largest community and tribal headquarters of the Jicarilla Apache Reservation. There are three different Archuleta names within a 20 mile radius north of Dulce, New Mexico. Closest is Archuleta Mesa, NM, 4.5 miles north of Dulce. Next is Mt. Archuleta, NM, which is 5 miles northwest. Third is Archuleta Mesa, Colorado, 6.5 miles north and across the state border. 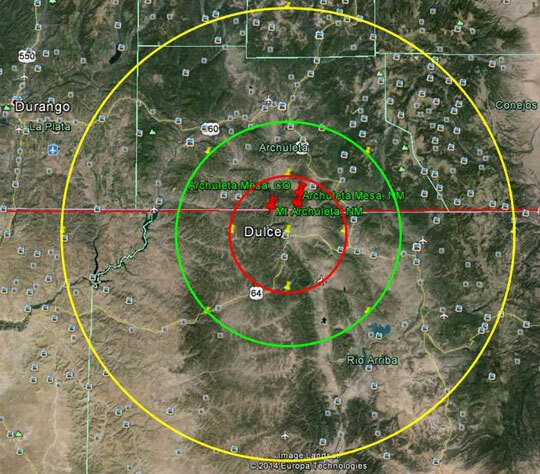 The “Dulce Grey ET Facility” is allegedly underground Archuleta Mesa and Mt. Archuleta,NM. August 29, 2014 Dulce, New Mexico - Back in the fall of 1979 when I was Director of Special Projects at the CBS station in Denver, Colorado, my crew and I traveled to Dulce, New Mexico, where rancher Manuel Gomez had several cattle mutilations on his ranch within a single year. All neatly bloodless, but not all trackless. Near one of the mutilated animals in the dusty pasture ground were a series of round indents as if golf balls in two parallel lines had been put next to each other in the dust. Around Dulce, the Jicarilla Apache natives who lived there pointed to the sky and said their ancestors, the “star people,” were the ones doing the animal mutilations. For them, it was a secret they would not talk about on camera. Back then was the first time I heard about the possibility of a large, multi-leveled Dulce underground where grey extraterrestrials did genetic experiments for reasons unknown. Previous PostPrevious Earth Life Is Dying In A 6th Mass Extinction As Great As Asteroid Hit 65 Million Years Ago – But This Time the Cause Is Humans. Next PostNext Part 2: Is The Dulce ET Underground Lab Linked to ETs from Zeta Reticuli 1 and Sirius B?